I’ve been having fun making a bunch of printables lately, and I have been trying to find some great quotes to use for them. I was stuck one evening, trying to figure out what to add into a printable, while also debating buying a new pair of gorgeous new boots. I kept clicking over to another browser window, gazing at the boots, and debating their price (even though they were on sale). 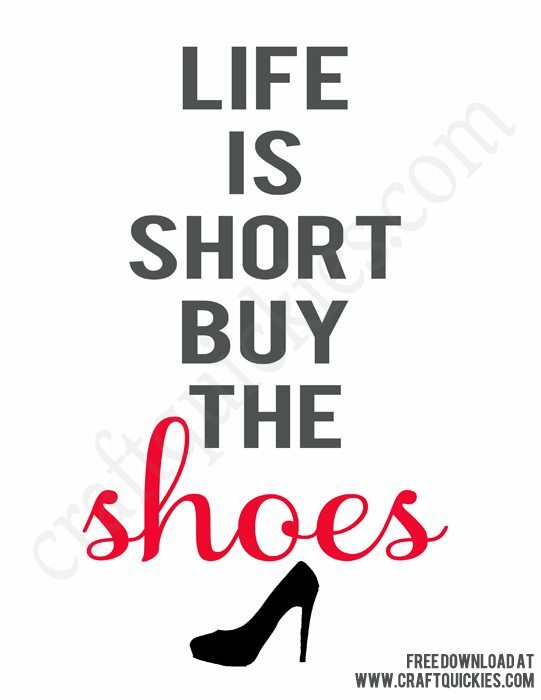 Finally, I let out a sigh and said to myself, “Life is short… buy the shoes”. And thus, this printable was born. Print and frame- or even mod podge onto a canvas and hang wherever you need a little reminder ;). (to see how I have added printables to canvas, head on over to my other blog, Sweet C’s Designs, to see an adorable little Audrey Hepburn quote I put onto a pretty pink canvas). The printable does not have a watermark on it like the photo above.